Vandogcages.com offers custom made dog cages made to fit in almost all makes and models of van. Our knowledge of how to hand make cages to securely accommodate dogs of all sizes and types helps us to offer van dog cages suitable for dog walkers, pet groomers, dog owners, kennels and many more dog loving people. It’s quite simple, dog cages for vans. Our cages can be made to suit your exact requirements. So whether you have 1 dog and just need to secure it during travel, or you are a dog walker, collection 8 dogs at once, vandogcages.com can create a bespoke set of van dog cages for your needs. All sizes of dogs can be accommodated for, just let us know what dogs you have and we will build a van cage individual to your specification. In addition to the dog cages themselves we also offer a variety of other van modifications to complete you dog cage van conversion. Air vents can be added to improve comfort for your dogs, ply lining can be added to protect the van walls, shelving to aid with storage, and we can even add sign-writing or a van wrap to complete the transformation of your van into a commercial dog transportation system. Our van dog cages are made from strong steel to ensure durability and strength. This also gives them excellent longevity for years and years or regular use. All floors on lower and upper levels of our van dog cages are created using resin coated ply, to give a water resistant surface that can be washed down easily and will not get damp or hold smells (should the dogs have an “accident” in transit). The steel cages and doors are powder coated to give additional durability and seal them against corrosion. Custom coloured cages are also available on request. WHO DO WE MAKE VAN DOG CAGES FOR? We create our van dog cages for anyone who needs them, but our most common customers tend to be dog walkers. Our cages allow them to securely transport a large number of dogs at the same time, without the worry of them coming to any harm as they are all secured in individual cages with lockable doors. HOW MANY DOG CAGES CAN WE FIT IN YOUR VAN? The number of dog cages that will fit in a van really depends on the size of the van. 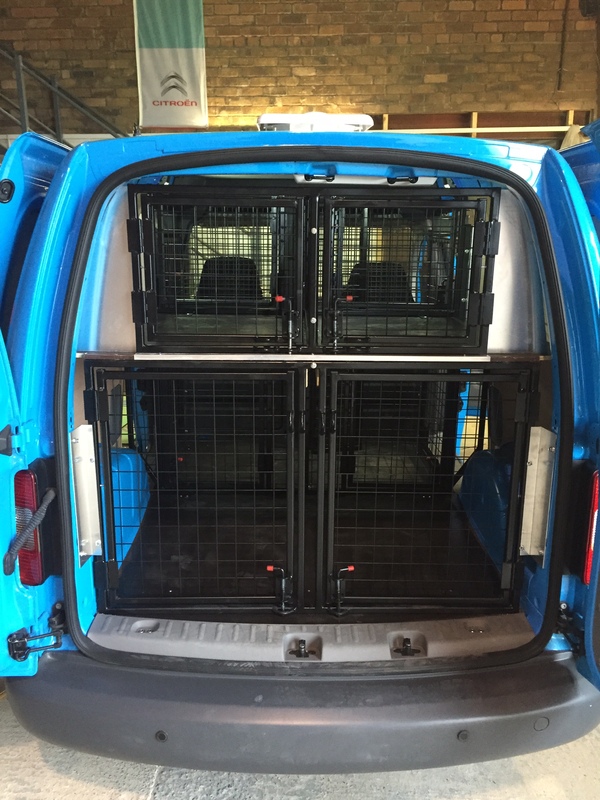 A small van such as a Citreon Berlingo or Transit Connect will accommodate a maximum of 8 cages without compromising the size of the cages (so the dogs still have room and the cages are not too small to accommodate a variety of sized dogs). 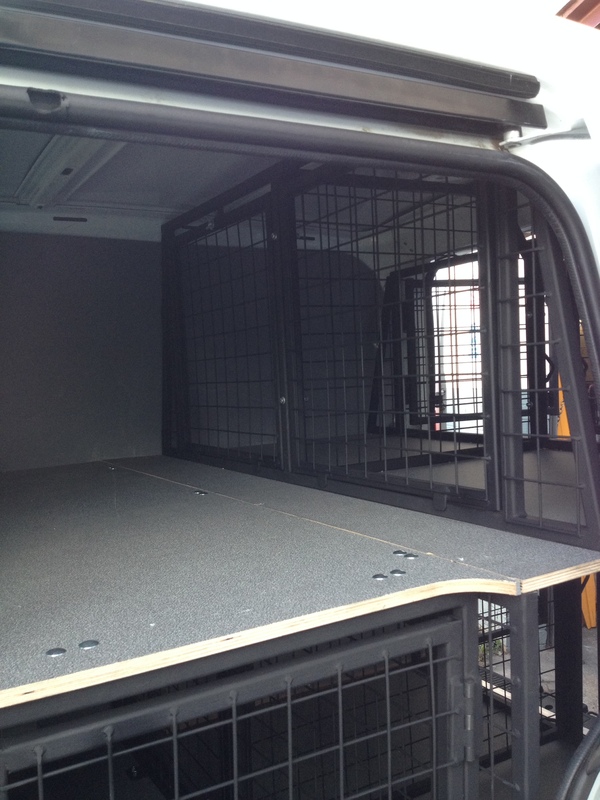 Where as medium sizes vans such as the Ford Transit or Vauxhall Vivaro will accommodate 10 or 12 cages if required. Longer wheelbase vans such as the Mercedes Sprinter or Renault Master will accommodate over 16 dog cages, however these are a very rare occurrence as not many people need to transport that many dogs at once. The usual set up we offer to customers with a smaller van (Peugeot Partner, Vauxhall Combo, VW Caddy, etc) will be a 4 cage system at the rear of the van. This style fo van dog cage is split over 2 levels, with 2 larger cages on the lower section and 2 smaller cages on the upper section. 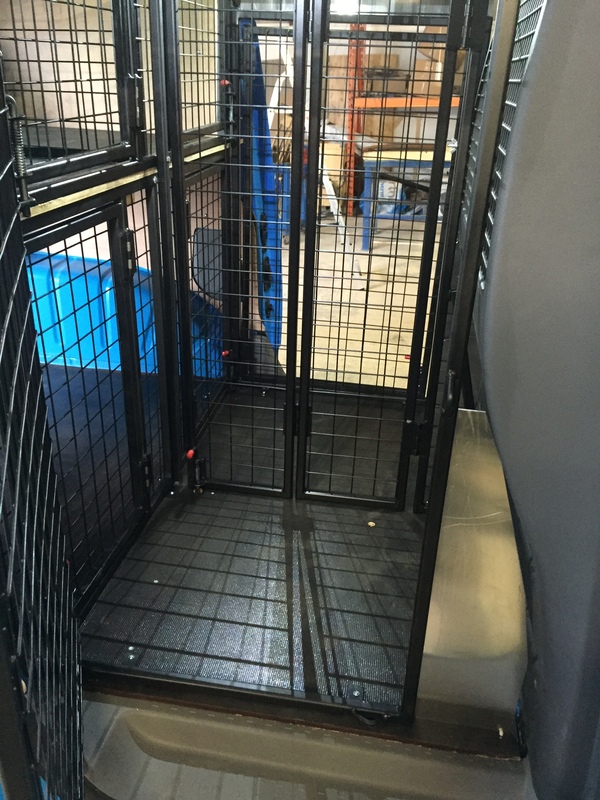 The number of cages in the small vans can be increased further by adding in a single large cage in the middle section of the van, this very large dog cage can then have a partition added down the centre that allows it to be converted into 2 large cages if required. So 6 cages in total in a small van. For medium size vans (Renault Traffic, Peugeot Expert, Ford Transit Custom, VW Transporter T5 / T6, etc) and large size vans (Citreon Relay, VW Crafter, Nissan NV400, etc) there is much more scope to add in cages of varying size and position. The increased width of these vans allows for the possibility of 3 cages in a row on each level. Additionally the medium and large sized vans can also have storage areas incorporated if the entire van doesn’t need to be converted into dog cages. Shelves can be added and other storage areas to make the most efficient use of the space. One of the major optional extras we like to suggest to our customers is to add in an air vent as part of the dog cage van conversion. We offer 2 types of air vents as part of our van conversions. A standard wind driven air vent and an electric version. Obviously the wind driven air vent will only work while the van is on the move (or there is a strong wind), if you are only likely to have the dogs in the van whilst driving then this is fine. But if you are likely to be stopped for an extended period of time then we would suggest adding the electric air vent to make sure the dogs are getting fresh air no matter if the van is moving or not. Another way we like to ensure the dogs in our van cages remain comfortable is to not overcrowd the cages into the van. We can install over a dozen cages into a small van like a Mercedes Citan, but the cages would be quite small and the dogs probably wouldn't be too comfortable in them for more than a few minutes. Safety is also an important factor to us. To make sure the dogs are as safe as possible we manufacture all our van dog cages to have escape doors on the rear or side. This means that should you have one of our 4 cage systems installed in the rear of your van, and you have a rear end collision that stops you being able to open the rear doors. The escape doors will allow you to remove the dogs from the cages from the inside of the van. So the dogs will not get trapped inside the van in the event of an accident. On medium and large sized vans we can design the dog cages to incorporate storage areas, shelves and other nifty little storage solutions that will allow you to maximum the usable space inside the van around the cages, so that should you require it you still have the ability to use the van for other tasks (non-dog related). The most popular storage solution our customers tend to opt for is to have some cages at only half height, this allows us to install a shelf on top of the cage for storage of coats, and other equipment. Another nifty feature we add to our van dog cages regularly is a collapsable partition wall. This partitions allow large cages to be divided into 2 smaller cages. The benefits of this is that it can allow for the transport of very large dogs on certain occasions. And this space can be converted into 2 cages on the occasions the you need to fit more dogs in the van. Here is a brief overview of the main features and benefits our van dog cages can offer. Each cage is made to order to your exact requirements. No need to worry about the floor getting damp and holding smells. Just let us know how many cages you need in your van and we will try to make it work. You can choose your menu to be sticky, or sticky after a certain scrolling distance or just when you scroll up. That is the level of control you have. UK LEADING DOG CAGE CO.
Our van dog cages are fixed to the van, but fully removable when you sell the van, or no longer need to have cages installed. We offer air venting and larger dog cages to maximise the comfort for the dogs inside the cages. 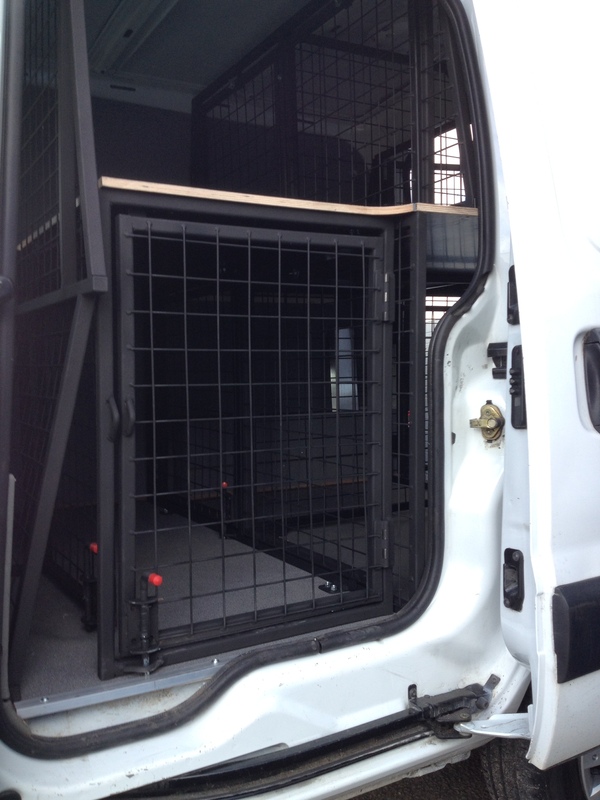 All of our van dog cages are made with escape doors to make them safer in the event of an accident. We offer a variety of partition wall sections to allow you to divide the dog cages if required. HOW TO ORDER A BESPOKE DOG CAGE CONVERSION FOR YOUR VAN? The first step is to either give us a call on 0161 641 8374 or send us an email to enquiries@vandogcages.com or fill in the form at the bottom of this page. We need to know what van you have and the number of cages you require. If you are unsure on exactly what you require, we can also offer suggestions based on our knowledge and experience. All of our van dog cages are made and installed by hand at the workshops in Golbourne, Warrington. The workshops are located directly opposite Sofology HQ, you are always welcome to pop in but it is best to call ahead as space is limited when we are busy. 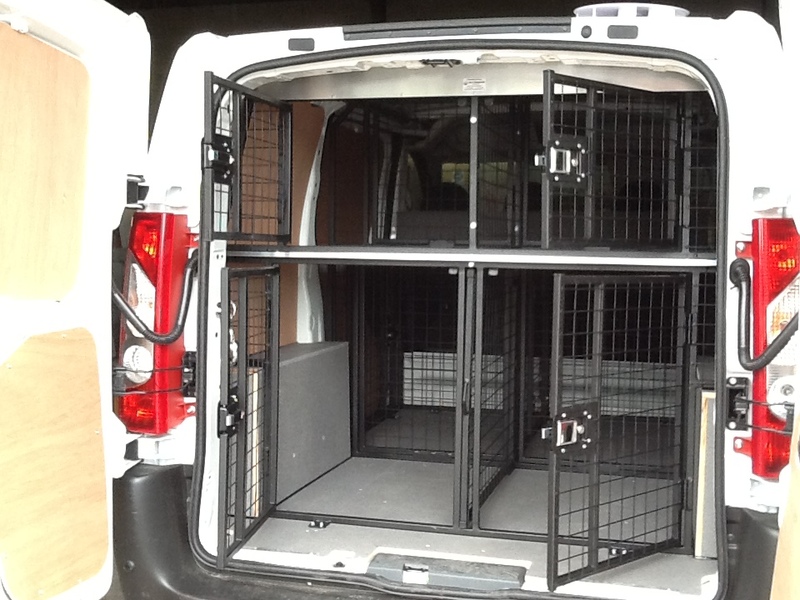 Vandogcages.com are based in Warrington, Cheshire and offer custom made dog cages to suit most types of vans. We predominantly work for clients in the North West (areas such as Manchester, Liverpool, Cheadle, etc) but we also regularly undertake van dog cage installs for customers from all over the UK (Yorkshire, London, Newcastle, Somerset, Cotswolds, etc). Most dog cages take 5+ days to install into the van, so dropping off the van to us in Cheshire and leaving with us for the majority of a week is something we can easily accommodate. Send us a message to get a custom quote for your van dog cage conversion. Any other info you feel may be useful to us.